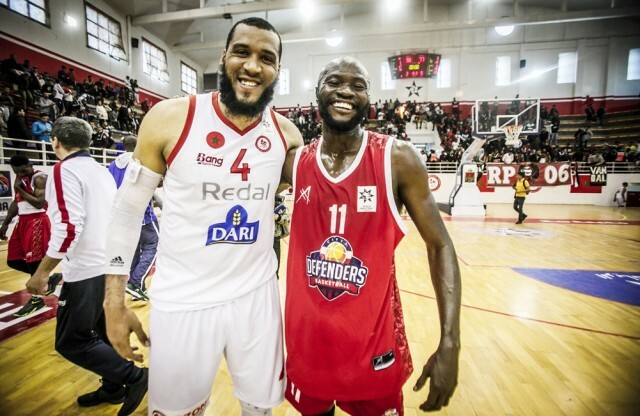 Abderrahim Najah led AS Sale to the last four of the FIBA Africa Basketball League with a 96-77 win over Civil Defenders Basketball Club on Friday in Sale, Morocco. Defending champions Association Sportive de Sale closed the two-game Elite 8 series with a 165-146 win on aggregate. With the first leg ending in a draw 69-69 two weeks ago in Nigeria, it was an open tie for the two teams with the winner advancing to the last four. Najah who missed out of the first leg in Abuja, Nigeria two weeks ago to injuries, was instrumental for Sale at both ends of the court. The AS Sale forward finished with a game high 27 points and nine rebounds in 28 minutes of play and was a handful for most part of the game. The Nigerian side showed resilience and were very difficult to break down in the first half of the game and trailed by just 4 points at half time (49-45). Defenders caused the host to turn over the ball 13 times before half time, going neck to neck with the champions while shooting 9 three pointers in the first half. Wayne Arnold and Bradon Wood both contributed 18 points each while Abdelhakim Zouita had 14 points and Mohamed Choua scored 10 points for AS Sale. Wood made 3/7 from behind the arc and 75% from the free throw line in 30 minutes off the bench. With 7 minutes left on the clock, Sale led by 17 points a huge mountain to climb for the Nigerians who could not cope with their opponent’s offense. Ocheibi Okpe scored a team high 19 points and seven rebounds while Ibe Agu added 16 points and hit three of his seven 3-pointers in the game for Defenders. The defending champions will join Primeiro de Agosto and Smouha of Egypt in the last four of the FIBA Africa Basketball League. The winner between JS Kairouan and Etoile Sportive Rades will pick the last ticket to the semis.